The Department Store, located at 10 Northcroft Street in Takapuna, is a refreshing change from the bland sameness of shopping malls. It’s a groovy industrial space – polished concrete floors, concrete ceilings and exposed beams – occupied by some savvy designers and retailers. Karen Walker Clothing, Black Box Boutique, Simon James Furniture/Design and Michael Lett Galleries occupy the ground floor, along with The Marr Lab (organic, non-toxic skin care), and The Tea Room (excellent coffee and delicious treats – I love the poppy seed cake!). There’s so many gorgeous things to look at and try on, and I really enjoy browsing the range of books on offer – architecture, design, cookery, art – the goods may be up-market but the atmosphere is relaxed and friendly. A white spiral staircase leads to Lucy and the Powder Room (beauty spa), and the new Top Shop is on the top floor, sharing space with Stephen Marr Hair. 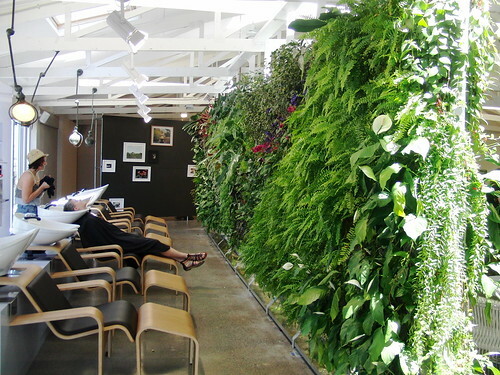 The wash basins are cleverly hidden from view by an exotically lush, living wall of plants, all growing quite happily and providing a soft contrast to the hardness of the concrete. This building has come a long way since it was used as the Post Office (I worked there as a bank teller in the 70s). Good on the designers and business people who had the sense to retain the building and reinvent it as a superb, sophisticated retail experience.